We were joined by the incredible Rod Harris on 10/26/16 who carefully captured some gorgeous moments, documenting one of our very last light-filled rehearsals at Studio @ 550. 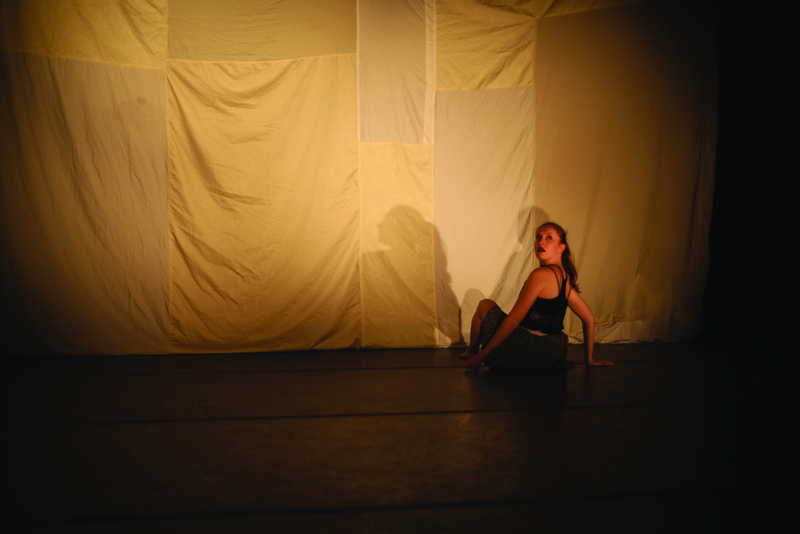 The piece, featuring Katie McGrail & Katharina Schier, will debut Nov 11&12 at the Boston University Dance Theatre as part of Luminarium's Portal: Stories from the Edge. A few strung together journal entries in attempts to find an ending to my newest performance-based creation. Some time around the end of spring 2016 I decided I wanted to make something based on communication. I had a visual in my head of two active figures moving amidst a group of maybe five passive individuals that would serve to occupy space and observe, but not interact. Since August I've been working with Katie McGrail and Katharina Schier - both incredibly engaged performer/participants - to make this come to life. As these things do, my thought has been evolving and deepening since August as the piece decides where it wants to go. In rehearsals and my own thinking I am digging into how the two active performers, Katie and Katharina, are connected. On a basic level, what would happen if the only other person that you can communicate with was someone you loathe or someone with fundamental differences of opinion? Yes, we have to work to understand each other, how far should one go? How do you act when you aren’t heard (if you act)? I’m also considering communicative ulterior motive, manipulation in communication and as a device, and fluidity in self and relationship. I communicate as the person I am at present, a different person than I was in the past, so what happens if we speed transformation up onstage and the feeling between the two individuals is allowed to evolve? I realize there is a lot here, but as I explore with the dancers I think we will isolate what’s most important to the specific statement we end up making. Since this is a nonverbal piece, amusing since it’s about communication, instead of words I am building a language from movement and interaction. Yes, dance-makers do this in most every piece we build, but I'm treating this instance differently. It’s very important that both movement and interaction are very authentic— genuinely conceived and executed with minimal superfluous choreography. Throughout the process I've made some material for Katie and Katharina that requires some form of decision making, be it in how they interact with each other, how they choose to physically absorb the material, or how they outwardly present the movement they possess. 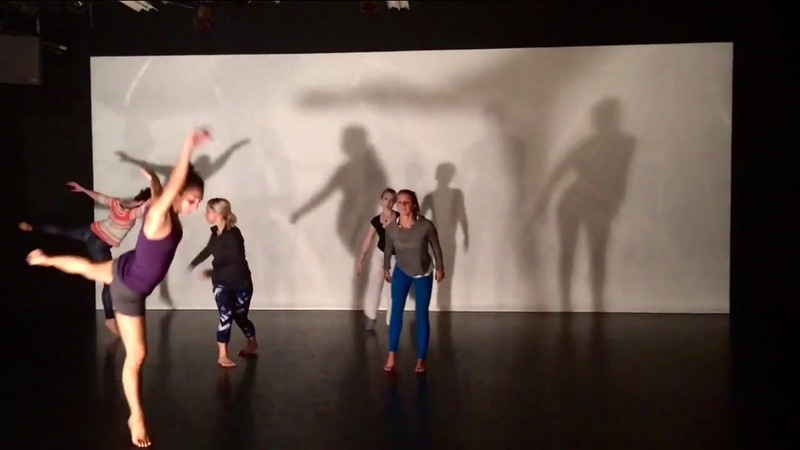 Rehearsal footage demonstrates our beginning efforts to make movement that speaks. In Manipulation Sketch 1 I tried to make the movement dependent on the genuine interactions; the phrase can only really advance with the moments of touch and those instances are real reactions instead of purely choreography. Manipulation Sketch 2 lets the dancers rotate through a pattern of floor work, the dancer not completing the choreographed movement acts as a manipulator before rotating into the set movement, at which point their roles switch. The floor work is set in advance, the counterpart-reaction is purely impulse based. Solo Phrase 1 is an attempt at setting movement that speaks. It isn’t as partner dependent as the other two rehearsal videos, but I tried to give each action cause for happening and gave the dancers autonomy over delivery of the movement. Last week’s rehearsal primarily consisted of discussion. I tweaked one small moment that was bugging me, and we joked that was all we were able to accomplish, but it was great to sit with Katie and Katharina and get their feelings, input and opinions about the piece and process. Ideas of importance are considering ways to keep the movement present and how we can prevent the pathways of risk taking from becoming stale or comfortable. Another concept to keep present are the idea of the observers joining them on stage, what does that entail and ultimately mean. The themes of surveillance, observation, and power mentioned in group study are intriguing, as are the noted moments of resonance (such as the chin tap) in comparison to their physical experiences. We danced the work one more time to cap off the rehearsal and I feel like it gained both a new dimension with additional understanding and also a sense of clarity. The first six minutes of this piece have presented a consistent feeling through struggles with power dynamic, all considerations of relationship and tempo and I feel that it’s due for a shift. Compositionally I feel that Katharina has been pushed a lot in the beginning segment of the work and her presence needs to change. I feel a sort of defeat coming for her, a withering up of sorts, so that Katie can discover that there’s no interaction or communication without someone on the other end. Perhaps stripping some of the communication back to find vulnerability before building back into a duet will be the direction I go. It’s important to me that I continue to discover and clarify themes in this work. 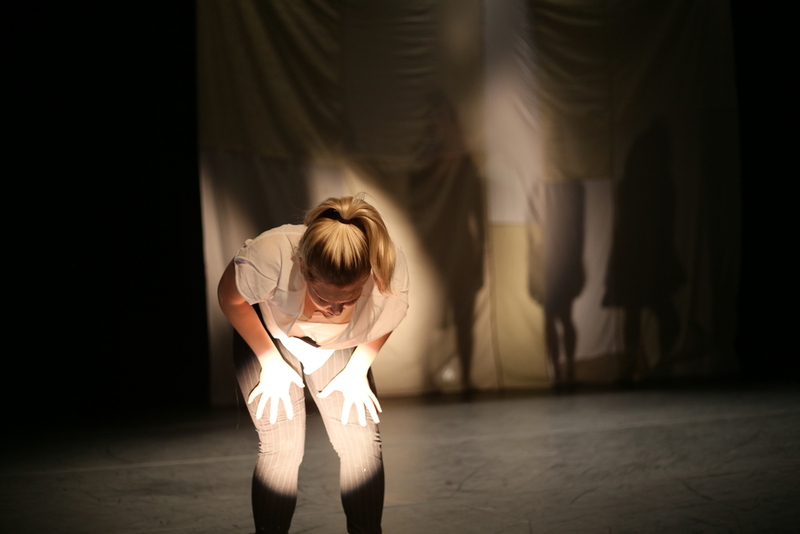 My current opinion of rabbit hole cycles is that it inspects a performer’s role in a new space and in changing environments, and the roles of the individuals in a group, in a quirky performative sense. The space(s)/worlds in the piece are far from real, and yet they are indicative of real life; a crowded street carnival or parade, the rehearsal space, a unpopulated outdoor space. The performers’ actions and impulses on stage are far from how people act in real life, and yet they’re representative of the human condition. The piece explores behavior in space, a closed experiment of sorts, while exploring artificiality in performance and day to day life. The dancers’ over the top faces and gestures are artificial moments usually confined to theatrical settings, but artificiality is similarly prevalent in the normal everyday life we experience. How often do respond “I’m ok” instead of speaking our minds when asked the question “how are you”? More questions for the piece to explore: How do we act in a variety of new spaces, how do we act to each other, when do we perform, when are we the most artificial, how does being part of a group affect our actions, what happens when the dynamic of a group changes, is it possible to escape a cycle? References I’ve been exploring and utilizing throughout the process include the sound that I previously mentioned (Rabbit Rabbit’s Hush, Hush, Timber Timbre’s Run From Me), Dr. Seuss’ Star-bellied Sneetches, The Truman Show (yes, the 90s Jim Carrey movie), the work of M.C. Escher, Lewis Carroll and more. Often when I engage in a conversation about what I do, the topic of music comes up. I'm frequently asked 'how I find music to make dance to', which is hard to answer since I so rarely work that way. My process typically begins with making movement based on thought; the generated material is soundless, or danced over something minimal to set a general tone. When I start this way I can clarify what I'm trying to say and determine how I can then use sound to develop and enhance the idea. I often end up either making the piece some sort of sonic environment to live inside, or listening to music endlessly - live, recorded, recommended by friends, stumbled upon by accident - to find a fitting match. This is not to say I don't ever work narratively with music, it's just less common in my methodology. When I do work from music, I gravitate towards work with certain character of its own that demands I create movement to it - it often feels like my current Bach piece choreographs itself - or I opt to work alongside a composer to make dance that compliments music and vice versa. However there is a third way music comes into my work (and probably many more ways beyond that), which is music as strictly early-phase inspiration. I experienced this to a new level of intensity over the last several months. In the early days of planning for Spektrel I was lucky enough to get to join the talented musicians of Jaggery on stage at the Museum of Fine Arts for a collaborative piece in their da Vinci inspired show. The opener was Rabbit Rabbit, a duo comprised of musicians Carla Kihlstedt and Matthias Bossi, and while at the time I was unfamiliar with their music, I was so quickly blown away by their gorgeous sound and lyrics. Towards the end of their set they played a song called Hush, Hush, and I fell in love on first listen. More importantly, the song catalyzed early ideas for a new work (coincidentally/tentatively already named rabbit hole cycles at the time) that had been slowly marinating in my brain. Rabbit Rabbit's Hush, Hush is beautiful, an ambient acoustic lullaby that morphs into a creepy sing-song omen and then to terrifying rock ballad before returning to its original sound. Live, it was haunting, lush, devastating, lifting. (Possibly interesting to note: before I had the good fortune to be exposed to Rabbit Rabbit's Hush, Hush, I was struck by Timber Timbre's Run From Me - which also borders sweet and scary - as I thought about my new work.) Each transition to a new style in Hush, Hush is seamless, and unquestionably the right decision for where the lyrics wander. As for the lyrics, they paint very specific and familiar images through scenic metaphors; vague and yet incredibly universal glimpses into life. The music, words and flow to the song grabbed my interest in such an intense manner that I found myself painting mental pictures for several bits of the song. These in-head images started growing into the seeds of a warped piece that transpires across several separate worlds in the same stage space, like all of the events transpiring in one house, one life, that Rabbit Rabbit's Carla Kihlstedt sings of. Now here's the weird part. After making a new piece that was so heavily fertilized by the composition, performance and overall feel of a song, there was no way I could use said-song in this piece (even if the artists obliged)! It is just too complete a creation of its own to think I could/should add anything to it. It should exist just as it is forever. Also, for all of the inspiration and thought Hush, Hush provoked, its sonic aesthetic didn't end up as the perfect fit for what I was making (I decided instead to utilize a lot of altered sound from varied environments to make a new world for this work). While rabbit hole cycles has developed its own very specific identity as we explore, experiment and refine in the studio, I'm incredibly grateful to have snuck into the MFA audience before I danced that night as so much of the development of my new work is due to what my ears and brain took in in that seven minute song. To the artists reading this post, how do YOU work with sound? What are your experiences of being heavily influenced by visual/auditory stimuli that aren't visible in your final product? Side note: Take a minute to check out the musicians/groups mentioned above, maybe even more than a minute... I promise it'll be time well spent. Spektrel tickets and info here! What feels like a million years ago we showed a glimpse of my new work, rabbit hole cycles, at the Luminarium Gala. At that point I knew what the work was about, knew roughly what I wanted to accomplish, and knew the deadline to find a stable stopping point (yikes). More on the content of the work another time, though. The images below are really rough and experimental, of course! Most looks involve cheap clamp lights as placeholders (there's only so much a gal can haul through Central Square), and other makeshift equipment. I'm SO excited to show off the polished lighting and other scenic elements of this wacky piece but you'll have to come check out Spektrel if you want to be the first to see it! Tickets here. What do you think? Curious enough to come fall down the rabbit hole with us? Yesterday I wrote a blog post based on the process of creating a fugue. Original post can be found here. As part of my grad/MFA work, I've been discussing process through correspondence with my advisor who suggested I might give the dancers a chance to respond if I blogged about a process that so directly involved each of them. Exciting! Many thanks to Merli V. Guerra, Brittany Lombardi and Amy Mastrangelo once again, who are integral to the piece I'm creating and the spirit inside it! Historically, I like Kim's movement. Kim is a sweeping, swooping, jumping choreographer. Her phrases are big and wide. They stretch to all corners of the studio, to all seats in the house. They travel, they move you, they take you places. Long lines of energy shooting past the physical limits of our extremities. This is the kind of dance that I especially like to dance. So, suffice it to say, I was a bit concerned when in our first rehearsal for the "Fugue," Kim presented us with paper, sheets of music, dotted incessantly with teeny tiny black notes all over the scales. They were everywhere and abundant. They were frantically scattered about the page in no seemingly logical order, as if a clumsy waiter had spilled fresh ground pepper all over someone's beautiful song. We're gonna Kim-move to this? Well, as it turns out, yes we are. Even tonight I had to remind myself, in rehearsal, that I really ought to count the music, use the tools that I've been using as a dancer for the past one thousand years. But then again, this is an entirely new experience of dancing to music, or rather, dancing WITH the music, and maybe even, dancing BECAUSE THE MUSIC SAID SO. I remember once performing as a high schooler in my studio's dance recital, and I caught myself, on stage, realizing that I wasn't counting at all. I was just doing the routine that had been drilled into my body after hours and hours of rehearsal. It was exhilarating. 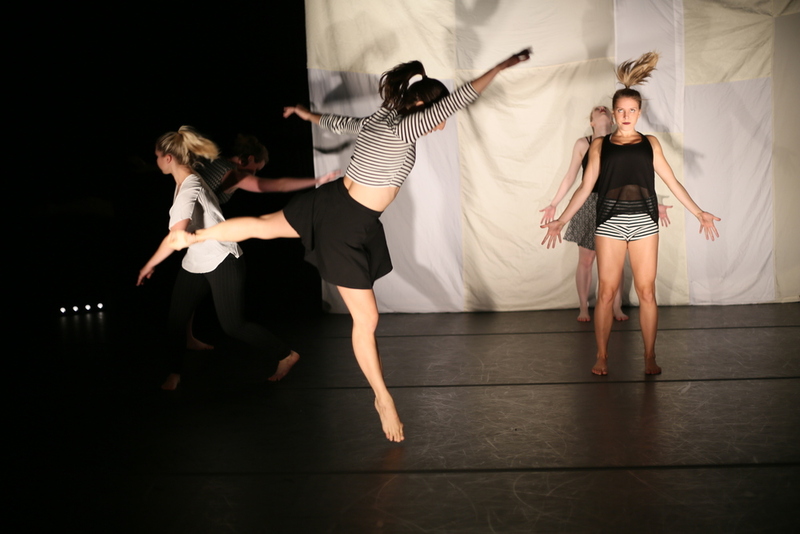 I felt like a real dancer, to move so seamlessly with the music, quite literally without even thinking about it. This is a similar, and yet slightly more enlightening experience. While I look forward to further drilling of this routine (my muscles need to make some memories, if you know what I mean) it's fascinating that, from the very very beginning, it wasn't about the counts, but it was very much about the music. While that seems like it should be an inherent concept in dance...it really isn't. The counts always go to the music; you can always find the 5, 6, 7, 8, somewhere in the song you're listening to. This time around, we're listening for our parts, we're listening for our movement, and oh, by the way, maybe there are numbers in there, somewhere, but don't worry about them just yet. So truthfully, when I come to rehearsal, I don't come ready to dance as I do come ready to think. And listen. And hear. And that's not entirely appropriate, because even though I need to think, and listen, and hear, Kim-movement is still Kim-movement, and even though the Fugue is fugue-ing at a thousand black dots a minute, my arms still need to stretch, my legs still need to swoop, and unless I'm instructed otherwise, my toes still need to point. Oh and also, there are two other dancing humans on stage, who are occasionally tethered to me. It's active, physically and mentally. It's hard, physically and mentally. It's slightly absurd, but all the best things are, aren't they? Despite our beloved Kim's calm, cool, and eternally relaxed and easy-going demeanor, this piece is not easy. But when has a bit of a challenge ever detracted from our love of dance? When has it ever stopped us? Um, I'll tell you; it hasn't, and it certainly won't now. The other night when Kim first approached me about writing a response to her post on creating the fugue, she phrased it as "My adviser would love me to gather your take on the challenges of this work, from the dancer's perspective." Only one tiny problem… What challenges? For me, this piece has been a delightfully intuitive break from the typical Kim Holman rehearsal process (and believe me when I say that I love the typical KH process!). Allow me to give you a little tour of the typical work flow when Kim creates—having been in many of her works over the years. We, as dancers, enter the studio with only a vague understanding of the work as a whole. Gradually, through experimentation, and the additions of phrasing and sense of purpose, a piece unfolds—with the final step being the ultimate layering of a finely-tuned sound score that magically fits our own internal timing of each moment, movement, and phrase. Let me boil that down: Typically, the musical timing is taken off of us, and appears at the very end of the process! Now, welcome to the fugue: A piece dictated by the rigorous timing of a musical genius long since departed. Yes, the first rehearsal was without a doubt daunting, with Kim showing us a color-coded sheet music nightmare of notes, while the end result of a perfectly coordinated fugue seemed distant. Yet within the first two rehearsals, it became apparent to this musically-driven performer that this would be one of the simplest, most straightforward Kim Holman pieces I've performed to date! The beauty of the fugue from the dancer's perspective is that not only am I always easily aware of my own timing and choreographic phrasing (as Kim's done a wonderful job of carefully linking each movement phrase to fit the musical phrasing naturally), but I'm also constantly aware of my fellow performers' movements as well. The three lines of the fugue provide me with an auditory reminder of what Amy's up to as I perform phrase E and what Brittany's up to as I perform phrase B, as if an audible cheat sheet. And thus, the very reason this piece is incredibly challenging for the choreographer is the same reason the piece is so simple for the performers. Through Bach's complex structuring, Kim's work has been multiplied, while ours has been simplified. Yet I would be remiss if I did not in part credit this ease to Kim's planning behind the scenes. Without that careful planning, I'm sure all four of us would be sitting there scratching our heads week after week, as Bach giggles with glee from the grave. During the first few moments of our first rehearsal, I have to admit I was a bit confused; how was I supposed to interpret the notes within this piece of music without losing complete self control? The rhythm was complex, bubbly and somewhat hard to follow count-wise. Unfortunately I never had interest in learning an instrument growing up, needless to say I am kicking myself for it now! Within the first few weeks of rehearsals, after looking at Mardi Gras color coded sheets of music, a trippy YouTube illustration of notes in the composition and observing the movement quality on video, I discovered that I can learn how to follow music like a pianist. Tonight's rehearsal focused on the beginning stages of the prelude, a six minute integration of speedy pitches and mind boggling rhythmic obstacles. Each time I went through the motions of the choreography, my body slowly became one with the music; so much so that I forgot to count! For the next six weeks my goal is to be as invested in remembering accents within the different sections of the music as I am with becoming comfortable with sequences of steps. As a classically-trained pianist (in a past life) I have an inherent love for the challenge that is a Bach fugue. While difficult to play well I have always thought there was no comparison to the satisfaction of mastering Bach. There's a sort of pompous sassy joy to be found as your fingers romp over specific bits of rhythm, runs and jumps all over the keyboard. I could always luxuriate in Mozart but Bach made me sit up straight and bounce around as I played - especially the Well Tempered Clavier preludes and fugues. That bit of nostalgic romanticism aside, a few months ago I had the urge to create a new trio based on the idea that 'getting there is half the battle', exploring lateness, procrastination, the inability to get things done and proceed through life triumphantly and efficiently. Funny and a bit depressing (maybe just maybe hitting close to attention-deficit-home), and entirely set to Bach. A movement of the piece would be based on life/unforeseen circumstances getting in the way, another would be a sort of real life-chutes-and-ladders where the dancers got in their own and each others' ways as they crossed the space, and the third would be a sort of examination of internal and external distraction and discontent. Obviously the second movement of the piece had to be a fugue! Well Tempered Clavier's Fugue no.2 in C minor? Absolutely. 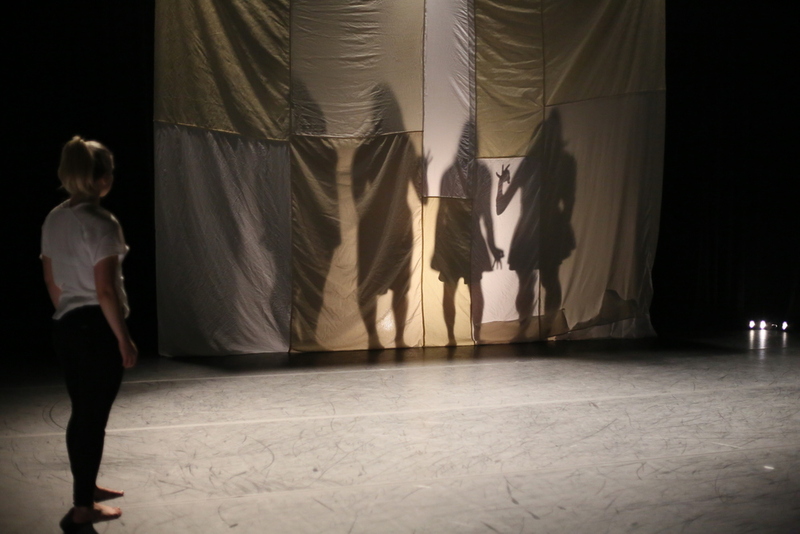 Three dancers, three voices, a tone that varied from bubbly to stately, the first time in the piece they would actually interact with each other through movement... it made perfect sense. Then came the idea of setting a fugue to a fugue; not just creating movement that corresponded to the music as a whole, but breaking the music into its three voices, digging through each of the three parts to find the content and repeating motifs and phrases, and making a compositional structure that could snap into the form of the fugue. Sure, there would be importance placed on the movement corresponding with the initial musical statement, but all of the other content and musical phrases wouldn't be swept under the rug as they, too, carry the piece from point a to point b. How quickly became the challenge. My dancers are incredible and rhythmic and eager to learn and master, but as it turned out, no one else spent babyhood to age 18 training at the keyboard. Turns out the knowledge I took for granted wasn't entirely an easy concept to teach - especially as I felt out of practice myself. We started by listening to the piece as a whole and watching this terrible-sounding visualization. Next step: I whipped up some color-coordinated sheet music as something to use as a visual aide as we continued watching and listening, just to capture the sense of motion in each voice and perhaps timing. Above: Mardi-gras highlighted sheet music and a really chaotic chart! I isolated similar phrases and motifs, breaking each voice into several parts (A through E, with some phrases played backwards/with other modifications). Each part got a set movement idea that I hoped would propel the action through space; for example A is the main theme and sends the dancer forwards, D (what starts at measure 9 in the lowest voice) runs down the keyboard dizzily, stopping here and there to regain power and focus. The last technique was plucking out the phrases on the baby grand in the studio as the dancers danced them individually. This was a sort of depressing reminder of how out of shape my fingers are, but helpful as a learning tool. 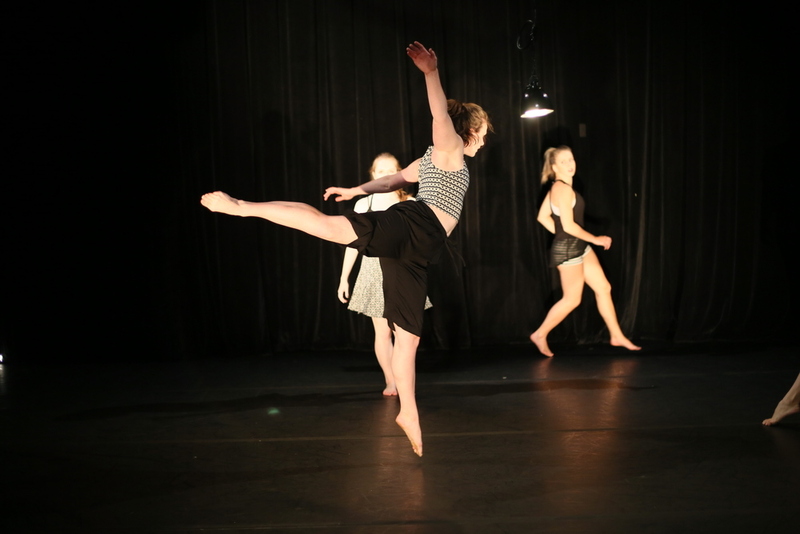 As each dancer learned her sequence of movement, how it correlated to the music, and how she might interact through the crossing phrase work with the other performers, I realized that my complicated scheme worked. I'm not a fastidious planner and when the movement lined up well from a structural perspective, as I had hoped it would, I was thrilled. (Here I also almost made the mistake of trying to incorporate the concept of a fugue state, probably over complicating things - but think about the similarities of the two, it would be fun to play with... next time.) How others try to create a movement fugue, I'm not sure, but I'd very interested to find out. Our new challenge as a group is continuing to hear the line you are dancing to, as you dance to it. I get the sense that my dancers are quite comfortable with the main theme and the overall flow of the phrases, but listening to all three parts at once while performing just to one is difficult, especially to capture the Bach-isms, and tiny differences between repetitions of ideas. Making the listening/dancing experience even harder, is that melodically this piece is all over the keyboard - the soprano and alto voices cross a lot, it's really chaotic and tricky to keep them separate while listening to both. That being said, each of my wonderful dancers is working, making clearer musical connections with every run and starting to bring their own sense of individuality into the fugue. I've asked the dynamite Merli V. Guerra, Amy Mastrangelo and Brittany Lombardi (aka the liberally aforementioned dancers) to send me their responses to this post and the process so you can hear their perspectives. Stay tuned! Also, if you've had interaction with a fugue in any genre I'd love to hear about your own triumphs, struggles and quandaries.